. It should be a great summer for new music. It seems that most of my favorite bands are releasing new albums soon (Wolf Parade, My Morning Jacket, Sigur Ros, etc). 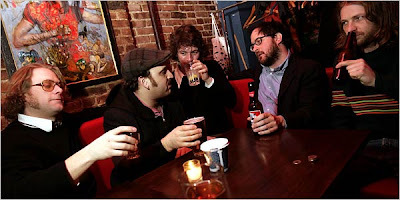 Included on that list are The Hold Steady and continuing another great trend they are streaming their new entire new album, Stay Positive (out July 14th) on their Myspace page. On first listen, I'm digging it...Craig Finn can really do no harm in my eyes though. On behalf of Rough Trade, Beggars Digital and The Hold Steady, many thanks for plugging "Stay Positive" (street date 15th July) ... .. thanks, also, on behalf of the label and the band for not posting any pirate links to unreleased (studio) material and, if you / your readers want good quality, non-pirated, preview tracks, “Sequestered in Memphis” is available for fans and bloggers to stream / link to on the band’s MySpace ... .. check-out http://www.myspace.com/theholdsteady and http://www.theholdsteady.com for details on “Stay Positive” and the band’s 2008 shows and keep an eye out for details of further, preview material and exclusive content. This album is epic. The best of the year so far.